After all the documentaries that have been released in the past nine years showing those indelible footages of the twin towers’ destruction and the moments of agony the world lived on that 9/11, Steven Spielberg is opening a new chapter to witness and record the new World Trade Centre that is to rise again from the ashes of Ground Zero. The production of a series of documentary in six parts to be entitled “Rebuilding Ground Zero” is planned to be completed and released in 2011. 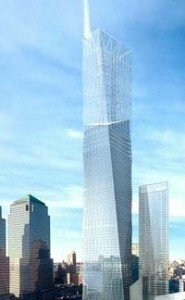 The structure that will be build in the former WTC site will be called the Freedom Tower, a 540 metre tower to be the tallest building in the US, which development has begun in 2006 and is due to be completed in 2013. Next to the cubicle tower will also be the Reflecting Absence memorial and museum to commemorate victims of the terrorist attacks. The importance of commemoration and honourship of the lost lives in 9/11 is Spielberg’s main motivation for this work and, for this reason, has been warmly welcomed by New York’s mayor Michael Bloomberg. The documentary will make use of advanced technological means including computer modelling techniques, 3-D and time-lapses cameras through which Spielberg will recreate, as only he is capable of, the events that made history from that day.